A firm’s standing in the local market and its links with big international players are important considerations when selecting a local outfit for advice, heard delegates at Latin Lawyer 8th Annual M&A in Mexico City. In-house counsel use a variety of metrics to choose a local firm. A firm’s brand name recognition and the good reputation which usually comes with it is one of them. “I try to keep very well informed of how the firms are working in each country,” said Rodrigo Hinzpeter Kirberg, general counsel at Chilean industrial conglomerate Quiñenco. “I read a lot of magazines and newspapers and try to do my own survey and select based on reputation and human relations,” he explained. Good links with international firms also help in-house counsel decide which firms to choose. Isabelle Girard, Ontario-based general counsel to US conglomerate 3M, said local players that had alliances with a US firm were more desirable. Firms that were more flexible over how companies paid them were also high on the panellists’ list. “If I’m paying for it, I like to use a local law firm where I can sit down say we will pay a flat fee or pay the difference in parts,” said Girard. Litigation work emerged as the practice area in-house panellists were most likely to outsource. “We try to do most of the day-to-day work internally, except for litigation,” said Alejandro Cantú Jiménez, general counsel at América Móvil in Mexico City. Legal bulk work was another area some of the panellists looked outside for help. Girard said small law firms that are willing to take on corporate day-to-day contracts and other non-strategic affairs had the edge over their larger competitors. “I would farm it out at a low cost when the work load is really too high and you know it’s temporary,” she said. The same holds for large due diligence efforts. “For global transactions involving different countries, you need a firm that can handle all that volume and need expertise locally or internationally,” said Cantú. Decisions that involve specialised advice were another area highlighted by the in-house lawyers. “If we have tactical decisions that is in a very grey area that you don’t know and can’t give a yes or no answer, the decision should be taken by the external lawyers,” said Hinzpeter. 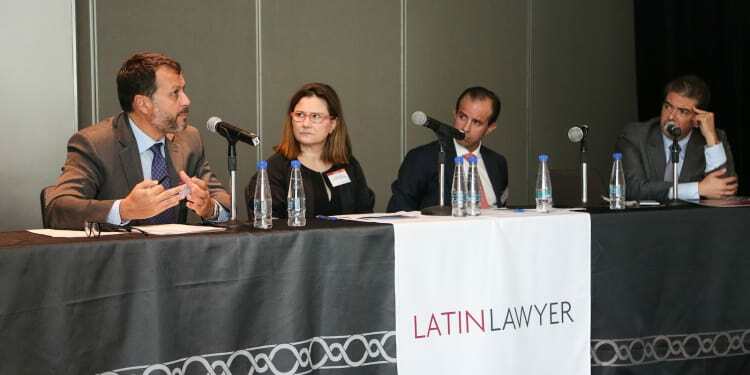 The panel was moderated by Mijares, Angoitia, Cortés y Fuentes SC partner Patricio Trad Cepeda, who also co-chaired the March conference alongside Skadden, Arps, Slate, Meagher & Flom LLP’s Paul Schnell. Previous panels focused on the threat corruption poses to M&A deals; collaboration between local and international counsel; and Mexico's oil and gas sector.